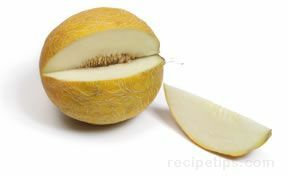 A moderately new melon, sometimes considered as being a honeydew melon, that is a cross between a cantaloupe and a honeydew. 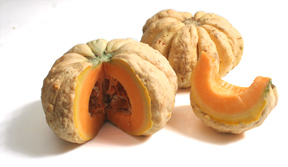 This variety has a very thin rind with small wrinkled lines crossing around the outer skin. Inside, the bright greenish-cream colored flesh provides the mild taste of a honeydew melon and the sweeter flavor of the cantaloupe. 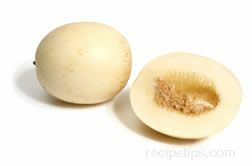 When selecting a galia melon, its shell should have an orange tint that turns yellow when ripe. When pressure is applied by pressing thumbs on either end of the melon, it should give a little. The galia melon is delicious when eaten as is or when served with other fruits. It is also used in salads and soups.